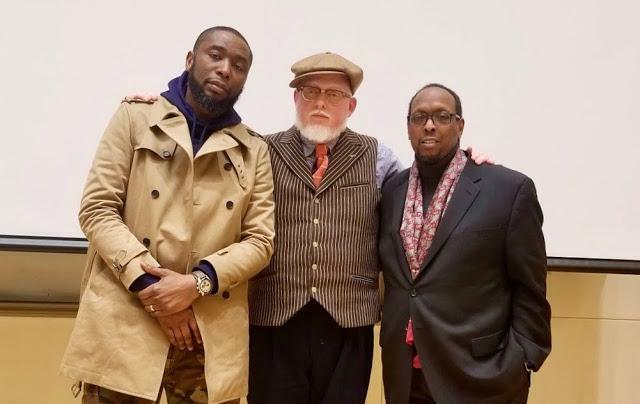 The following are taken from notes on a conversation between underground hip-hop artist Brother Ali, James P. Duke Professor Mark Anthony Neal, and Duke professor and Grammy Award-winning hip-hop producer 9th Wonder that took place during Duke University’s History of Hip-Hop course on 3/6/19. The conversation between the three panelists began with a discussion of Brother Ali’s work in Minneapolis and why the city was an artistic home for him. Brother Ali suggested that Prince defines the musical legacy of Minneapolis, and the city’s musical production really can’t be understood outside of Prince’s legacy. Prince married a deeply nuanced political and racial consciousness with a wide-ranging musicianship, and the pop legend’s ability to play every instrument imbued the city with a spirit of musicianship. According to Brother Ali, everybody plays something. This musical spirit in Minneapolis enlivens its hip-hop scene, and Minneapolis hip-hop really developed with inspiration from groups like Little Brother, 9th Wonder’s legendary underground hip-hop group from the Triangle. Minneapolis hip-hop developed in the message board era in which underground music was developed and distributed on message boards and chat rooms. The conversation then shifted to discuss the interweaving of politics, religion, and community in hip-hop. Brother Ali suggested, “When we say politics, we are really talking about community. When we say art, we are really talking about culture.” Brother Ali reads hip-hop as inextricably linked to community cultural expression, and the connecting material that intertwines politics, community, art, and culture is energy. For Brother Ali, “energy is everything,” and it defines the beautiful intersections that he tries to capture in his music. Brother Ali in an offhand comment also mentioned that “Islam is the unofficial religious tradition of hip-hop” to which Professors Neal and Douthit nodded in agreement. From the radical numerology of the Five Percenters to the legacy of Malcolm X for nationalist artists to the long history of Islam in African cultures dating before the transatlantic slave trade, it’s not difficult to see the truth in Ali’s comment. After all, Big Daddy Kane, Rakim, Brand Nubian, the Wu-Tang Clan, Nas, Busta Rhymes, and Jay-Z all incorporate the Five Percenter Supreme Mathematics into their lyricism. Lauryn Hill incorporates prominent Islamic phrases for keeping it on the straight and narrow in the lesser-discussed religious aspects of her opus Miseducation. Hip-hop also provides a framework for many black Muslim youth in the U.S. as detailed by Su’ad Abdul Khabeer in Muslim Cool: Race, Religion, and Hip-Hop in the United States. Undoubtedly Brother Ali’s comment suggests an important reality about hip-hop and Islam’s often overlooked intimacy. Professor Neal suggested after the brief discussion about energy, community, and hip-hop’s religious history that black community leaders are held to different standards than others in American public culture. Brother Ali agreed, quoting Malcolm X, “In what other community would entertainers be called their leaders?” Professor Neal pointed out the robust contribution of figures like Charles Barkley to the contemporary political moment and asked the class if there are any white entertainers or athletes who are expected to speak on political issues the same way. Students did not have any substantive suggestions, and the idea that Tom Brady was the best that white folks had to offer was resoundingly rejected by the panel. 9th Wonder agreed that Stephen Colbert may be the closest that white culture has to a leader who fulfills this role, but there still wasn't really a substantive comparison. Brother Ali said that he sees the greatest entertainer-leader in the black community as Muhammad Ali because of the nuance of his politics and the extent of his fame in the boxing realm. The panel then continued to affirm that black celebrities are always expected to comment on politics, and they often fill roles as political scientists on network news shows, a fact that black political scientists as a profession likely meet with a bit of ire. 9th suggested that this dynamic in the black community opens up space for conscious emcees to be taken seriously, and hip-hop expands the artist-cultural critic figure into the 21st century. 9th and Brother Ali began talking about underground hip-hop and the idea of a working-class artist. Brother Ali said that artists like Murs and Little Brother getting record deals was a big deal for underground artists because it provided a framework in which underground artists could make a living without having to compromise their artistic vision. He joked that a lot of underground artists bragged about not selling out, but it’s pretty easy to not sell out if you don’t have any offers. The working-class artist development that came alongside the rise of the internet allowed underground artists with offers to make the music they loved without aiming towards the superstardom of some of rap’s bigger names. 9th agreed that being a working-class artist is defined by doing the thing you love and always making a living out of it, and he illustrated his point with the film I Am Legend. He said that when he got his start in 1996 that all of the music lovers were being run into the house by the radio zombies. There didn’t seem to be a public space in which non-commercial or non-radio artists could thrive and be exposed to fans craving their style of content. The internet served as the connective space for these artists, and message boards and chat rooms became the home of the working-class artists. While streaming services like Spotify largely mirror the same type of commercial separation that radio did in the 90s, Soundcloud and similar sites can continue to be homes for artists who want to be financially comfortable and make compelling political music. 9th concluded this discussion with the suggestion that working-class artists have to A&R themselves until investors will put money into their work, and that’s what lands working artists a record deal; 9th reads working-class artistry as very similar to self-entrepreneurship in the business sector. Professor Neal then asked the perennial question, who are in Brother Ali’s top 5. In a true hip-hop head’s fashion, Ali qualified that these are the top five not necessarily for him personally but the five who he thinks are the greatest for the culture. First, Ali listed Jay-Z. For him, Jay-Z’s longevity and lyricism combined to make him one of the best to ever do it. Only LL Cool J really develops the same longevity, but he doesn’t share the same business acumen and lyricism as Hov. Jay-Z’s music—according to Brother Ali—really only develops one theme: his life. This quality changed hip-hop for the better because it makes Jay-Z’s genius seem human. We are forced to look at Jay-Z’s growth and fallibility alongside his accomplishments, which lends a supremely human quality to his art. Second, Ali listed Lil’ Wayne. To Brother Ali, Lil’ Wayne’s consistency in producing great music is very compelling to his legacy. He also loves that every bar of Wayne’s is lyrical and that he has more true hip-hop bars than anyone else. Ali followed Wayne with Kendrick Lamar, who he sees as the Frankenstein of great rappers. Kendrick is the first second-generation (Ali reads the second generation of hip-hop as Jay-Z and up) to put the best of all of hip-hop into one person. Kendrick Lamar pulls strongly from the hip-hop tradition, so his music is accessible and interesting to old heads as well as to young folks. Additionally, Ali thinks that Kendrick hasn’t missed. From Section.80 to Good Kid to To Pimp a Butterfly to DAMN., Kendrick has produced more tight albums than any of his contemporaries and many of his predecessors. Brother Ali then turned to discuss his next in the top 5, Rakim Allah. To Ali, Rakim represents a monumental shift in emceeing stylistically, and his innovation is unrivaled. Rakim lies at the center of the aesthetic shift in hip-hop’s rhymes from nursery-rhyme level simplicity to complex poetic expression. Additionally, he marries this aesthetic innovation with great stories. Ali said that Rakim’s raps are almost as if he is simply saying “these are the words that come out of me,” and he relies almost solely on his genius to construct his music. Lastly, Brother Ali added Ice Cube to the list. He thinks that although 2Pac was undoubtedly great, he owes a lot to Ice Cube stylistically, and as the primary author of gangsta rap, Ice Cube deserves some credit. Ali did mention that Cube’s legacy is tainted by his steep musical falloff in the mid-1990s, but his historical body of work is nonetheless irreplaceable in the hip-hop canon. The conversation concluded with a few ruminations on how black performers engage with the entertainment industry. Brother Ali made the important point that hip-hop artists who enter into the film world—artists like Snoop Dogg, Ice Cube, Mos Def, and Queen Latifah—almost always perform in films as their rap personas. These artists’ film performances are particularly complex because they are a performance from a performance identity, and performances like Queen Latifah’s in Set It Off are twice removed from her identity as Dana Owens. We must then read black media performances in these contexts differently than other performances. The panel also pointed out to the class that black performances that they see in mainstream media outlets are always promoted by an interested media, one that is selective of the black images that it places on its airwaves. Artists like Janelle Monae perform explicit sexuality as rupture to this curation of black images in national media, and her anti-definitional sexuality gives space for black women’s pleasure. The panel concluded by encouraging students to consciously consume black performances within media representation.